Dan Smith and Louis McCubbin are celebrating Hampshire Junior Pairs glory, writes Dave Wildman. The Southsea Waverley talents booked a second trip to the national championships at Royal Leamington Spa with the victory. And their club will represent the east in the County Club after a 10-shot win over Cowplain in the regional final. Cowplain suffered further disappointment when their Rowland Hospital Cup defence was halted in the second round. They lost by 24 shots at Leigh Park, while last year’s runners-up, Priory, went down by 28 to Alexandra B. At Swordsands, second-division Naismith beat Waterlooville A by 14. Also through to the last eight are Rowner, Portsmouth Water, Southsea Waverley B and Bedhampton. In the Portsmouth & District League, Priory’s hopes of chasing down Waverley at the top of division one were dealt a blow. 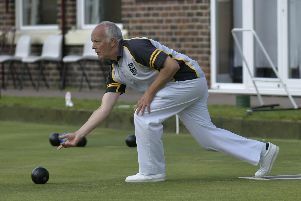 They fell to a five-shot defeat to Lee-on-the-Solent – with Nigel Mundy’s rink doing their best to win it single-handedly. Lee and now joint second on shot difference, while Waverley are 64 points clear at the top. The leaders ensured Fareham are still looking nervously over their shoulder with a 23-shot victory. Waverley won on three rinks – led by Gary Starks’ quartet. Charlie Bailey’s rink prevented a whitewash. Alexandra made it two on the trot as they thrashed strugglers Bedhampton by 49 – with big wins on the rinks of Carl Baggot and Steve Feilder. Rowner are also deep in trouble after a 16-shot loss at Leigh Park. Ben Cope’s rink led the way for Leigh, while Rowner are now 24 points from safety. Vospers eased their relegation fears – beating Waterlooville by 27. They only won one rink but the 33-shot success of Terry Smith’s quartet was key. In division two, leaders Cowplain beat Naismith by seven. Naismith put late pressure on the leaders but the turning point came on the 20th end of Mike Hyland’s match, where he was poised six down. A trail of the jack saw him turn that into two shots and ease the pressure on his Cowplain team-mates. Milton Park kept up the pressure with a 36-shot win at Hayling Island. Mick Molloy’s rink led the way with a 20-shot victory. Dave Friend’s Hayling rink grabbed a tie. 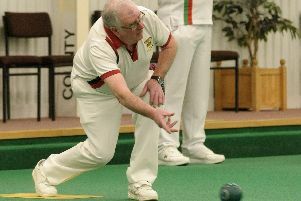 Gosport banked maximum points in a 55-shot win over Crofton – with only Ken Stanbury’s rink not managing a double-digit margin. Brent Riste’s rink recorded a 14-shot success to help Portsmouth Water win by 15 at Denmead. Star & Crescent recovered from a savaging at Cowplain to inflict a 40-shot victory over Purbrook Heath. They were led by the 34-shot win on Simon Filippi’s quartet. In division three, leaders College Park recovered from two defeats the previous week to beat second-placed Cosham Park by 21 shots. That defeat allowed Phoenix to leapfrog Cosham into second spot after their three-shot win at Pembroke Gardens. The triumph was all down to David Blowe’s rink as their 12-shot victory was Phoenix’s only winning score. Gas Social moved into third with a 52-shot win at Emsworth. They won on all rinks.